Control Solutions’ Model VP4-0630 ValuPoint® Programmable I/O for BACnet MS/TP is a BACnet Application Specific Controller (B-ASC) with 6 I/O points and programmable control. The VP4-0630 is a scaled down, low cost version of the VP4-2330 featuring 2 universal inputs that may be configured as analog or discrete, 2 dedicated discrete inputs, and 2 Form A relay outputs. 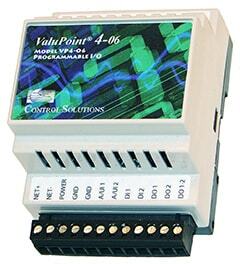 The ValuPoint VP4-0630 is useful as slave I/O or as a very small soft PLC. The VP4-0630 is designed to be a building block in a distributed control system where controllers communicate peer to peer via BACnet MS/TP. 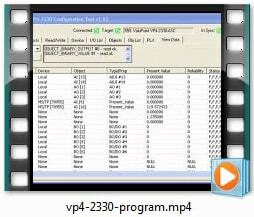 Each ValuPoint controller can access BACnet objects in other BACnet devices, both ValuPoint controllers and other manufacturer’s devices. Remote objects are mapped to local objects that mirror the value of the remote object. 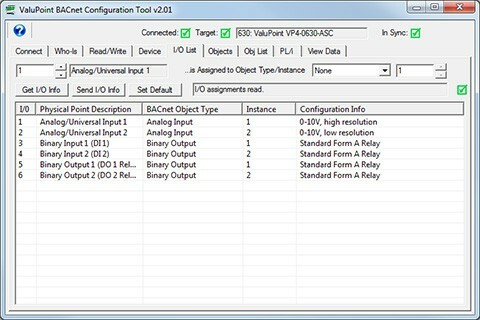 The VP4-0630 configuration tool connects to the MS/TP network using the MTX002 MS/TP to USB adapter (if not using a BACnet IP router). This intelligent adapter plugs into your PC's USB port, and offloads the MS/TP token passing from the PC to make it more reliable. 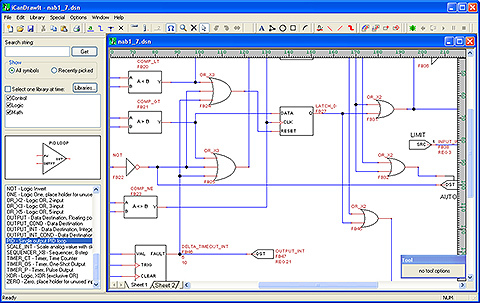 The MTX002 allows you to connect your PC to an MS/TP network running at 76800 baud, something not possible with a generic RS-485 port adapter. 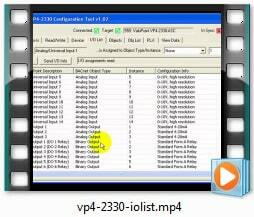 NOTE: These videos were recorded earlier for the VP4-2330. They apply in every way to the VP4-0630 with the only difference being the number of physical I/O points. There is only one change in the updated configuration tool: Select the model on the Connect page (not illustrated in the video, but is illustrated in the user guide).